Another new sport – HANDBALL. Which is completely insane. This is like water polo on land – lots of ‘accidental’ collisions and elbows and pushes and all that. A pretty violent sport. And hard work, as they need volunteers to clean the floor every now and again, as the umpire sees a particular damp patch from sweat. Or blood! I got reasonable seats, pretty close to the action at one end. But they were behind the protective netting – so photos weren’t brilliant!. But plenty close enough to see all of the pushing and showing. 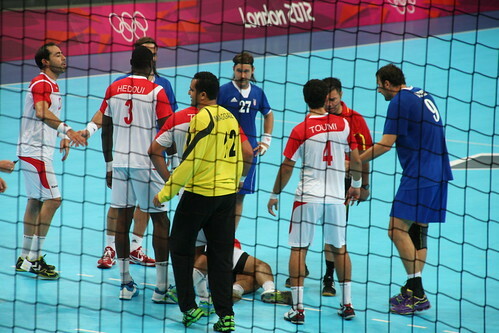 The handball took place in the Basketball Arena, although previously it had been in the Copper Box. As the matches got closer to the final, I’m guessing they upped the capacity. One thing about the Basketball Arena is that it’s at the other end of the Park from the main entrances. I’d followed the instructions and decided to ‘Alight at West Ham’. Which meant a 30 minute walk before I even got to the Park, which would be followed by at least another 30 minutes. But that night, I’d had a bad back, so the time I got to the gate, I was limping quite badly. And now the wonderfulness of the volunteers kicked in. my limping was commented on, I was asked if I wanted some help. I expected to get a lift on one of the buggies they were using. But no, it must have been a quiet night because next thing I knew, a wheelchair was pulled into action, I was wheeled around to the mobility station and presented with a mobility scooter. I had wheels!!! 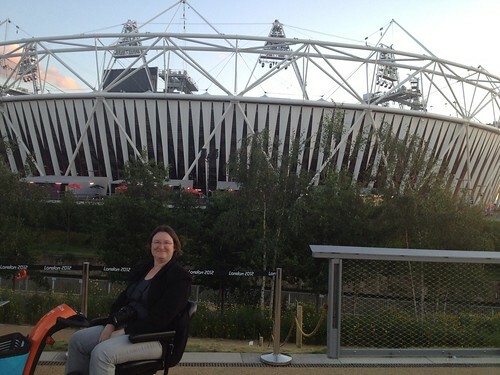 During the trundle up the park, i stopped at some of the Sponsor pavilions and checked out their disabled access. Had no problem getting into the couple I tried. At the Arena, it was easy. There was parking for the scooter, and after the venue just picked it up again and trundled back.